It is the brave who conquer life’s many frontiers. The physical and emotional boundaries that enclose us keep the weary from reaching the majestic worlds that aren’t, in truth, that far away. 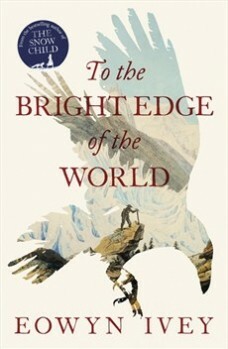 Eowyn Ivey’s To The Bright Edge of the World, set largely along the Wolverine River Valley in the untamed and wondrous Alaskan wilderness, shows how courage can lead to a world of awe. For Colonel Allen Forrester, the frontier he wishes to tackle is tangible. It’s 1855, and he’s on an expedition with a small group of explorers across Alaska. As his great-nephew says of Colonel Forrester’s trek in a present-day exchange with a museum curator, it was “surely the Alaska equivalent of Lewis and Clark’s.” Ivey’s quick allusion does its job. We see that Colonel Forrester is, indeed, a forger—someone determined to set out and to conquer. We learn of Colonel Forrester’s journey by various journal entries, letters, news-clippings, drawings, and photographs. It’s inside these personal documents that we learn the most about the true personhood of Colonel Forrester. On the outside, he portrays himself as strong and confident—a true man among men, but in his journal, he reveals his truth: “I had hoped for five strong men. Instead I’m given three reluctant Indians, the young woman who claims to have skinned out her husband, & a dog.” There’s trepidation in his commanding voice. This epistolary approach that Ivey employs allows us to not only better understand Colonel Forrester, but it also allows us to feel as if we are along on the journey, basking in the newness that the world has to offer. It’s an inviting scene, with the lush descriptions of the pure wilderness, but there is a pervading darkness that lingers in the background’s shadow. Soon, an enigmatic Eyak Indian appears and causes Colonel Forrester to question the mysteries of the untapped world that surround him. A low food supply threatens his life. Wild animals and unknown peoples do the same. To make matters worse, he begins to fall under the spell of fantastical Indian myths. After pulling a crying baby whose umbilical cord is attached to a tree root to freedom, Colonel Forrester struggles to stay atop his very primal battle with nature. Still, he continues because he has no choice. He is a frontiersman, with a conquering spirit. Colonel Forrester isn’t the sole brave explorer in To the Bright Edge of the World. Back home at Vancouver Barracks, Sophie Forrester, his young wife, has her own set of frontiers to conquer. What she desires for her life is true meaning and a real sense of personal value, but she struggles in attaining these feelings because of the oppression placed on her gender. Men laugh at her because she seeks equality. For instance, Sophie pleads to join her husband’s crew of explorers. She has the intent to work alongside the men. She says, “What should I bring? An abundance of warm clothes. Definitely my walking boots, for I am told the deck is often treacherous with ice and sea spray. My field glasses and notebooks of course, with plenty of spare pencils.” But those in charge view her femaleness as a handicap. She’s lambasted and sent back home. Being home, away from the man she desperately loves and struggling to find purpose, she has her breakthrough. She remembers that her own life—one filled with her desires and her dreams—is worthy of pursuit. She says, “Since I was a young girl and first caught sight of a mourning warbler and knew it for what it was, or first heard the song of a wood thrush in the forest just as rain clouds lifted, I have sought some form to express myself.” She finds her answer in photography. She purchases a camera and begins mini-excursions around her home in hopes of understanding the outdoors that she is finally able to explore. It is in Sophie’s love for photography, and exploring the bright edges of the world around her, that Ivey exemplifies one of the novel’s great motifs: light. Light, symbolizing hope and new beginnings, ignites Sophie’s spirit. Sophie remarks, “I might work with light itself. It was always captivated me, the way it shifts and alters all that it touches, significant both in presence and in absence.” Exploring the outdoors, under the natural light of the sun, causes Sophie to transform. She says, “It is most difficult for me to express the joy, the complete relief, to at last return to the forest and find that I have the strength and resolve to walk up the hills and down through the trees, to breathe in fresh air and act upon my own will!” She, like her husband, becomes changed by the newness that engulfs her, and she interacts with the environment in ways that, to her, were previously hidden. Sophie’s sudden (and near-consuming) interest in personal happiness is not a mask for being in a problematic relationship—not at all. She desperately loves her husband, and she gushes about the joy he gives her. She confesses in a letter: “I miss you more than I can bear.” And then: “I see now that you are more than husband or lover, for you are my dearest friend. I have a freeness of emotion with you that I have never before experienced.” Sophie faces the task of being a wife not because she has to; instead, she joyously chooses to do so. Ivey writes Sophie’s thoughts so beautifully, combining emotion with such direct succinctness that it cannot be anything other than truth. The feelings these small declarations of love generate are powerful reminders of just how well constructed both Sophie and Colonel Forrester are. Ivey’s novel is an American epic. It is expansive, taking place from the mid-nineteenth century all the way to present day. The characters are brilliantly rendered. The feelings are genuine. All of the plot pieces come together and create an experience that feels as rewarding as the very conquests inside the novel. To the Bright Edge of the World has a light layer of surrealism that softly swirls over the quiet and affecting novel’s heart. It’s not magical realism, but it possesses otherworldly sensibilities. It’s not poetry, but so much of Ivey’s novel feels lyrical. It’s the novel’s quietest moments—the lush descriptions of the scenery, the uncovering of one’s self, the soft depictions of love, and the swirling aura of gentle melancholy—that To the Bright Edge of the World soars. Is there comfort in the gleaming snowy landscape she creates? Or is there something hidden in the darkness of the night hoping to haunt us? The answer depends on the heart of the explorer. Bradley Sides is a writer and English instructor. He is a regular contributor to BookBrowse. His work appears and is forthcoming from Electric Literature, Fiction Southeast, The Lit Pub, Literary Orphans, The Rumpus, and elsewhere. He is working on his first collection of short stories.